Lookee What I Got! NaNoWriMo Time is Nearly Here! And if I still have words remaining, I will start the sequel to My Fair Vampire, aka My Fair Phoenix. Estimated word count = 0 to ?? Wish I could go for it, too. Maybe next year. Have fun. THanks, Ryan! I hope you can do it next year. “Operation–Finish Your Damn WIPs” is a great plan and will be a great accomplishment! I’m looking forward to my first NaNoWriMo. Will start with Lusted in Las Vegas the follow up of Marooned in Miami then move on to the saucy corporate story. Fun, fun! Half the fun of NaNo is knowing everybody else is slaving away doing the same. I’m sure your first will have you back for more and more. 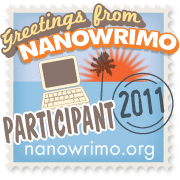 My first NaNo remains my most memorable. Good luck to ya!